CarGurus has 897 nationwide Veloster Turbo listings starting at $6,495. Hyundai’s heady 3-door, 4-passenger 2016 Veloster Turbo compact hatchback shows off a few subtle and not-so-subtle tweaks. Expected to remain available in the sporty Coupe trim and the stripped down R-Spec trim, the pint-sized and peppy Veloster Turbo is slated to debut a brand new Rally Edition for 2016, as well. The R-Spec-based Rally Edition will debut with upgrades like lightweight RAY 18-inch alloy wheels mounting performance all-season tires, a B&M short-throw shifter, an even more athletic suspension, faux-carbon-fiber exterior trim pieces, and a new Matte Blue exterior color scheme. The downside lies in that this uber-agile Veloster will be a limited-production trim; only 1,200 units are scheduled to be made. Minor, noticeable (with a close inspection) tweaks in both the R-Spec and Coupe iterations include the now vent-less hood, restyled 18-inch wheels, an improved TFT vehicle information display, and upgrades to Hyundai’s touted Blue Link infotainment technology. All Veloster Turbo variations continue to be powered by a 1.6-liter turbocharged inline 4-cylinder (I4) engine capable of 201 hp and 195 lb-ft of torque. For 2016, however, the 6-speed shiftable automatic transmission is replaced by a standard DCT (Dual-Clutch Transmission) 7-speed shiftable automatic gear box in both the Turbo R-Spec and Coupe variations. The new Rally Edition, furthermore, underlines its super-sport image by offering only the traditionally capable 6-speed manual transmission bolstered by the aforementioned short-throw shifter. Standard appearance features for the 2016 Veloster Turbo and its R-Spec sibling are expected to include the newly-reworked 18-inch alloy wheels and heated power-adjustable mirrors. Inside, the top-shelf trim boasts leather upholstery, heated front seats, full power accessories, cruise control, and telescoping tilt-wheel steering, to go along with air conditioning and a rear-view camera. Entertainment, meantime, is anchored by a 450-watt premium stereo sporting a CD player, 8 speakers, satellite radio and—new for 2016—standard Pandora internet radio. Additionally, all 2016 Velosters will pack newly-upgraded (and Bluetooth-interfaced) Blue Link infotainment functions, accessible via a 7-inch touchscreen. For the upcoming model year, both the R-Spec and its new Rally Edition offshoot delete a few of the fancier features standard in the Coupe. However, both add in a sport-tuned suspension, which the Rally Edition further tweaks to provide what the folks at Hyundai describe as a driving experience far above what you’d expect in your typical hatchback. Additionally, all Veloster Turbo variations also pack new-for-2016 steering-wheel-mounted paddle shifters. Options scheduled for 2016 include GPS navigation, a power sunroof, dual-zone automatic climate control, Hyundai’s Active ECO system, and rear parking sensors. Standard safety equipment in all 2016 Veloster Turbo trims includes 4-wheel antilock brakes (ABS), traction and stability control, front side-mounted airbags, front and rear head airbags, LED daytime running lights, front fog/driving lights, and Blue Link emergency alerts and stolen-vehicle recovery assistance. All versions are also expected to pack a remote antitheft alarm, with the top-shelf Veloster again boasting standard turn-signal-integrated mirrors. Automatic headlights return as an optional safety feature for the lineup, as well. Meanwhile, this capable 3-door hatchback does pretty well in government safety tests, but the Insurance Institute for Highway Safety (IIHS) finds the 2015 Veloster lineup to come up a bit short in front and side impact tests. 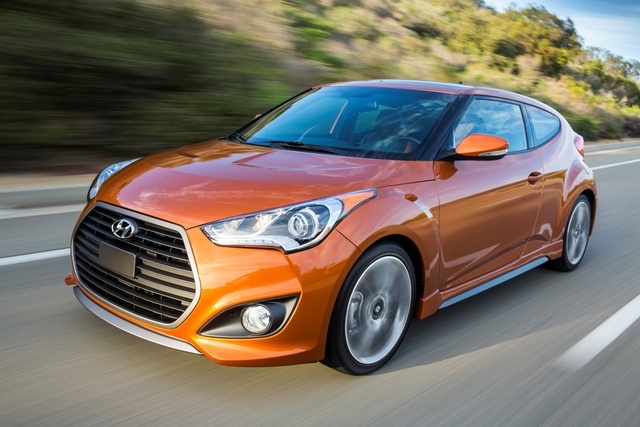 What's your take on the 2016 Hyundai Veloster Turbo? 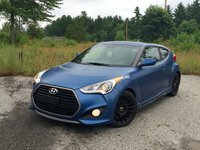 Users ranked 2016 Hyundai Veloster Turbo against other cars which they drove/owned. Each ranking was based on 9 categories. Here is the summary of top rankings. 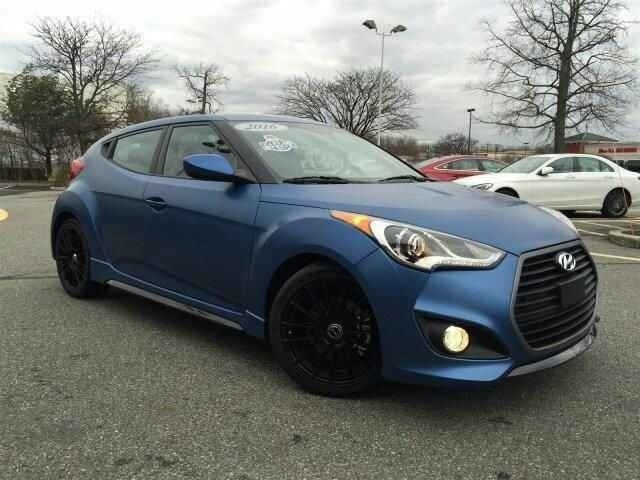 Have you driven a 2016 Hyundai Veloster Turbo?